The dealer in Match Play 21 will always hit on soft 17. You can split any equal cards for an additional bet equal to your initial bet, and you can continue to hit on each hand, whatever the cards. You can re-split once, giving you up to 3 hands. You can double down on any cards, and after a split. Insurance is available at a cost of 1/2 your initial bet. You can also surrender at any time, in which case you lose half of your entire bet and the hand is forfeit. Like other casino games from RTG, Match Play 21 is a top-shelf game. The interface is very simple and intuitive, and there is no learning curve for the game so the moment you open it up, you can start playing. Everything you need is right at your fingertips, arranged just right to give you the best possible view of the action. Better than that, the graphics are brilliant! The top-down perspective gives you a great view of the table, and everything, from the chips to the plus green table, looks very realistic. This game makes for an outstanding blackjack experience! First and foremost, remember that this game has no 10’s, so you have a slimmer chance of getting blackjack with Match Play 21 than with other games. This is balanced, however, by the 10 additional payouts. As a result, you can basically play this game as you would any standard 6 deck blackjack game, because even though the odds change slightly with the 10’s missing, the other bets hit often enough to make up for it! We really liked Match Play 21 when reviewing games for this site. 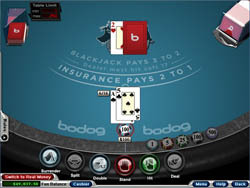 The reason is it’s very close to any standard blackjack game out there in terms of rules and odds, but there are 10 additional payouts thrown in which don’t require a side bet. Try to find that in another blackjack game! We never hit the mega 40:1 Match Play payout, but got several of the others during a short hour of testing. This one is a gold mine, don’t miss out!